Impeccable After Shave is pleased to offer several products to enhance the shaving experience and maximize impeccable results when treating razor bumps (Pseudofolliculitis Barbae) and other shaving problems. 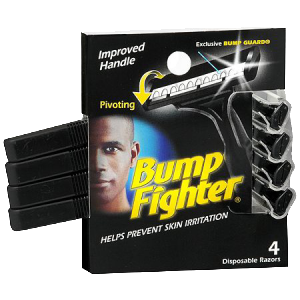 Exclusive Bump Guard technology helps prevent skin irritation and razor bumps (PFB) associated with shaving. Sturdy, rubber-gripped razor handle offers comfortable shaving. Hint: As with any razor, if your sensitive areas (such as the neck) continue to bump, a combination of razor on the face and clippers on the neck may be useful. Proper shaving technique and use of Impeccable After Shave are key to a smooth, bump-free face.